The same rules of polite conversation apply to adults and children. First, introduce yourself and explain how you are connected to the child. Depending on the child's special needs, it may be necessary to take the child's hand, place a hand on the child's shoulder or even touch each other's faces to make a proper introduction. Then explain the activity that you will be doing with the child. Explain the different steps of the activity, including the beginning and the end - while making as much eye contact as possible. Some children with special needs perceive sensory input in different ways and may be unable to verbalize discomfort. Remember all behavior is communication. Problems can be avoided easily with common sense: put safety first and arrange the environment for physical and emotional comfort. Some adults say that they will not change the way they do things to accommodate one person in a group. But the whole point of teaching is to use a variety of methods to help another person understand and master new skills. If a set of rules is presented to the group, apply those rules consistently to everyone. Having the right cues in an environment can mean the difference between participation and non-participation for many children with special needs.Tactile cues such as gently touching a person's shoulder, offering a blanket or other soft fabric, or providing silly putty are easy ways to mark a transition and get a person's attention. You know what they say about the best-laid plans. In the world of special needs, there is always a Plan B, and usually a Plan C. Make sure that there is space to calm down and move freely if things go badly. Think about what each participant can do instead of focusing on what they can't contribute. A positive attitude is the single most important quality for anyone who works with children with special needs. Chassidic Master Rabbi Simchah Bunim of Pshische was walking along a riverbank in the city of Dantzig, when he saw a man swimming deep in the peaceful waters. Suddenly, a powerful wind blew tall waves that rose high near the man, and caught by surprise he lost his balance. Help me, I'm drowning! The Jew's piercing shrieks tore Reb Bunim's heart, but the Rebbe didn't know how to swim, and for miles around there wasn't another soul in sight. All he could do was watch. The Jew struggled and fought valiantly to save his life, yet too soon, the forceful waves drained him from his energy, and Reb Bunim saw how the man succumbed. He appeared ready to die. The Rebbe shouted with all his might: "My dear friend! When you get down, send my warmest regards to the Leviathan!" The Jew burst out laughing. His sudden expression of cheer generated renewed energy. With fresh vitality he renewed his struggle and preserved until he was able to save himself. This story may be used as a metaphor for each of us. Life consists of a complicated journey through turbulent waves and we often feel like we're drowning in the challenges surrounding us. A primary element that can guarantee our success in making wholesome choices in life is maintaining a joyous, positive attitude. The blowing of the Shofar (the ram's horn) on Rosh Hashanah presents a blueprint for achieving this type of wholesomeness in our lives. Three types of sounds are emitted from the Shofar on Rosh Hashanah, known as Tekiah, Shevarim and Teruah. The Talmud defines the difference between the sounds as follows. A Tekiah is a straight blast (toooooooooooooo!) direct, long and simple. Shevarim, (too-toooh, too-toooh,) is a broken krechtz, a dejected sigh. Teruah (too-too-too-too-too…) is a series of short cries of sobbing and weeping. These three sounds - Tekiah, Shevarim and Teruah -- reflect three distinct modes a human being needs to integrate into his or her soul in order to live a meaningful and inspiring life. There are moments during which we sob like the Teruah; other situations represent the brokenness of Shevarim. And then at times we encounter the complete and simple sound of the Tekiah. Let us explore how the sounds of the Shofar apply to our daily lives. Every individual commits sins. We make mistakes willingly or inadvertently, in moments of exhaustion, in times of stress, or on ordinary sunny days. King Solomon says, "There is no Tzaddik on earth who does only good and does not sin." At times we may do or say hurtful things to others, and when the dust settles, we feel guilty. There are many ways of handling feelings of guilt over acts of immorality and abuse to ourselves or to others. Sometimes we lack the courage to confess that we made a mistake, so we attempt to cover it up, pretend that it never happened. But truth is truth. One can bury truth for a little while, but not forever. In long term, the path of denial doesn't take us very far. On the other end of the spectrum, some of us wallow in endless shame and remorse. We're repulsed by our very selves: We feel evil, detestable, and lowly. We cannot face ourselves and we certainly cannot forgive ourselves. It is clear that both of these extreme mindsets are not productive, yet it is often difficult to define and implement the appropriate attitude to our wrongdoing. The holy master Rabbi Aaron of Karlin once remarked: The skillful art of the inner evil inclination (Yetzer Harah) is not in persuading people to sin; its ultimate strength and craftiness is in causing people to feel depressed after they sin. The sound of the Teruah is the key to adopting a valuable attitude to the wrongs we commit. Teruah is the sound of weeping and sobbing stemming the depths of our hearts. Implementing the Teruah means confronting your sin completely. Ask forgiveness from your soul, from G-d and from the individual you wronged. Acknowledge that you have fallen prey to your temptation, exhaustion, fear or insecurity. Accept accountability and apologize with complete sincerity. Resolve to act differently in the future. Repair what you can repair, and grieve for that which you cannot repair. Yes, cry your heart out. Yet there is another significant dimension to the Teruah. Unlike the Shevarim or the Tekiah, the Teruah consists of a series of short cries and it has as a cutting edge to it. Each sob of the Teruah has a sharp end to it. Similarly, our remorseful feelings must have defined parameters. We cannot sit forever in the muck wallowing or indulging in self-blame. We cannot allow the agonizing over a wrongdoing to paralyze us from living a productive life and fulfilling our G-d given mission. The Torah prescribes designated times for focusing on the wrongdoings we have committed and on our lowliness. The last month of the year, the last day of each month, Thursday evenings, every night before we go to bed -- these are times designated in Judaism for self-evaluation, including feelings of grief over our sins. This then is the key: the proportion must be preserved -- a daily hour, a monthly day, and the sorrow confined to these bounds. During those specified times, feel the anguish and guilt! It was bad; feel bad. Feel shame for the past and ask forgiveness. Your sorrow must remain an active seeking, never a passive sinking. Then, it's time to go on. When you seek forgiveness sincerely, G-d forgives. Now it's time to turn a new page, open a new chapter in life and move forward. That's the Teruah: powerful weeping for a limited, defined time. If the Teruah reflects the healthy way to deal with guilt and pain born of sin, the sound of the Shevarim is crucial in relating to another type of guilt and pain: our feelings of shame born from the inherent negative impulses existing in human nature. We ask ourselves: Why can't I always be in a good mood? Why am I insecure? Why am I afraid? Why do I get angry and jealous? Why is it so difficult for me to retain my integrity? Why do I always need to struggle against my instincts and drives? We need to remember that inherent to humanity is a Shevarim, which literally means brokenness and fragmentation. Every human being has two souls -- a Divine soul and an animal consciousness, described in the Talmud as a Yetzer Tov and a Yetzer Horah. The beastly identity consistently bombards us with negative thoughts and temptations, often just as we finish doing a mitzvah or in the midst of prayer. At the highest moments of a spiritual pinnacle, when we're feeling so spiritual refined, an ugly impulse rears its unpleasant existence. This may lead us to question the validity or sincerity of our goodness -- how can we be capable of inspired heights if we are tempted to such lowliness? But that is not true. Because inherent to our chemistry is the fact that we are Shevarim, we are fragmented and dichotomized, we have BOTH a G-dly soul as well as an animal soul, both very real components of our lives. G-d entrusted our pure souls with a mission: to shine through and beyond the shell of challenges presented by a tainted beastly self. In the heavens and in all the celestial worlds, there are millions of angels who scream "Kadosh, Kadosh, Kadosh!" (Holy, Holy, Holy!") The angels don't have any struggles, they never get frustrated or stressed, and everything about them is perfect. Not so with humans. Woven into the fabric of our being is an inherent dichotomy, a "Shevarim" -- fragmentation. On one hand we are spiritual and idealistic creatures gravitating towards what is good, true and eternal. On the other hand, we possess a selfish and egotistical identity, gravitating towards the earthly and the mundane. You must make peace with the truth that you may never resolve your inner conflict. In fact, it is this conflict that is a crucial part of the mission we are to accomplish in life. For only through our struggles, our challenges and yes, our stumbling and re-climbing, can we fulfill the purpose for which we were created: to introduce the light of G-d into a fragmented, materialistic and lowly universe. Feeling guilty for possessing a "Shevarim" in you? Remember that we are intended to be Shevarim: G-d created you with an inherent dichotomy; it's a central dimension of the human experience. Yet, after everything said and done, we often wonder how to remain inspired and animated. In the presence of so many struggles and pain, within us and around us, how can we continue with dignity and joy? How can we move on if we are shattered to pieces? After the war, a Holocaust survivor came to visit his one-time spiritual master, the famed Rebbe of the Chassidic dynasty of Ger, Rabbi Avraham Mordechai Alter. This broken Jew was deported to the death camps together with his wife, children, relatives and entire community. The man's wife and children were gassed, his relatives decimated and his entire community wiped put. He emerged from the ashes a lonely man in a vast world that had silently swallowed the blood of six million Jews. The Jew lost one more thing in the camps: his G-d. After what he experienced on his own flesh, he could not continue believing in a G-d who allowed for an Auschwitz. Although after the war he made aliyah to Eretz Yisroel (Israel), he completely abandoned Jewish practice and observance. Yet he missed his old Rebbe and went to visit him in Tel Aviv. "I descended from the mountain," Moses recalls, "the mountain was still burning with fire and the two tablets of the covenant were in my two hands. I immediately saw that you had sinned to G-d, making a cast calf. You were so quick to turn from the path that G-d had prescribed. I grasped the two tablets, and threw them down from my two hands, and I smashed them before your eyes." Now, considering the well-known meticulousness of each word in the Bible, Moses' words "I smashed them before your eyes" seem superfluous. Suppose Moses had turned around and broken the tablets out of view would that in anyway have lessened the tragedy? Why did Moses find it important to emphasize that the breaking occurred "before your eyes"? What Moses was saying, explained the Rebbe of Ger, was that "I smashed the tablets only before your eyes." The shattering of the tablets occurred only before your eyes and from your own vantage point. In reality, there exists a world in which the tablets have never been broken. "As hard as it is for you and I to believe," the Rebbe concluded, "I want you to know that the decimation of our families, our communities and our people occurred only 'before our eyes.' There remains a world in which the Jewish people are wholesome and complete. Beneath the surface of our perception there exists a reality in which every single Jew from Abraham till today is perfectly alive. "The day will come," said the Rebbe of Ger, "when that world will be exposed. Hashem will mend our broken tablets and our broken nation. We will discover how the tablets were really never broken and the Jewish people were always complete." The sound of the Tekiah helps us access the sacred place within in which the "Tablets" were never broken: The quintessential core of the human soul, untouched and unblemished by the pain of life. The Shofar produces primitive sounds -- simple and unattractive. Yet within all the blasts of the Shofar, the Tekiah is the least sophisticated; it's a simple, straight tone. If you open your ears to the innermost part of your soul's calling, you'll find that you are listening to the sound of a Tekiah. Every human being has a place within himself or herself -- the deepest level of identity -- which always remains complete, sacred and dignified. Nothing and nobody can corrupt or tamper with that "Pintele Yid," that dimension of self that is beyond all of our mistakes, our sins, our despair and our brokenness. It's a place in which the "Tablets" were never broken, a splendid little corner that remains untouched by even the deepest abuse; it remains intact regardless of our trials and tribulations. This pure and most simplistic part of our being cries out to us: Return! Come home to the place where you are as virtuous and guiltless as you were on the day you were born. The innocent cry emanating from the depths of a soul is echoed and carried in the sound of the Tekiah - basic, bare and simple. According to Jewish law, the arrangement of the sounds blown on Rosh Hashanah follows this order: Tekiah, Shevarim, Teruah, and Tekiah. What is the spiritual and psychological significance of this sequenced order? The beginning is always Tekiah, for every human's beginning is Tekiah. Every one of us experienced the state of being an innocent, fault-free infant. Back in that stage, we didn't suffer any disappointments; we believed in life, we believed in ourselves, in our parents and in our educators. We believed in our potentials and we were connected. It was just like that simple, unsophisticated, childlike cry of Tekiah. We didn't have sins to cry for in Teruah; we didn't have frustrations to think about the broken elements of life, the Shevarim. As we matured in life, the second stage of Shevarim emerged: disappointments and frustrations. We learnt that life is incomplete and that we can get hurt in this world. As we grew even older, we began performing our own mistakes and wrongdoings, as the third stage of Teruah took us over. Yet after the Shevarim and the Teruos, there's still a Tekiah: You begin with Tekiah and you can always go back to that Tekiah. There's a place in you that never sinned; there's a place in you that's always one with G-d. Yes, there's a place in you in which the "tablets" were never broken. Kol Nidrei night. The wondrous, transcendent moment that ushers in that special time is laden with feelings of profound intensity. Every Jew - young and old, man and woman, is inspired as he or she stands in Shul on Kol Nidrei Night. The image of the Holy Ark open before all the white-clad participants evokes a feeling of awe and passionate fervor. Kol Nidrei itself is chanted in a most soul-stirring melody, a tune that rouses listeners to emotional ecstasy. But have you ever read the actual prayer of Kol Nidrei in English? The basic meaning of Kol Nidrei is that all the promises, vows, oaths, acceptances, that I will accept upon myself and I will swear from this Yom Kippur until next Yom Kippur, are all nullified, extinct, naught and non existent. People are always making promises and vows during the year, and if they do not fulfill them they are committing a grave transgression. Thus, on Yom Kippur when everybody is in the Synagogue, we collectively nullify all promises, so that even if one makes a promise during the year and doesn't keep it, it was already nullified. It is not difficult to comprehend the value and practicality of abolishing vows. But the question is: why is the nullification of vows considered to be the holiest experience during the entire year? Why have Jews over the centuries been so deeply moved by the recital of Kal Nidray? What makes annulling oaths such a sacred experience? Rabbi Scheur Zalman of Liadi explains (5) that in fact, the words of Kal Nidray encapsulate the essence of what Yom Kippur is all about. As mentioned above, each of us possesses a consciousness that is essentially a reflection of G-d. This part of our self yearns for truth and spiritual depth and has no interest in asserting its ego or engaging in unproductive physical endeavors. This soul, a spark of G-d, craves integrity and G-dliness. But this spiritual soul, the higher self, is residing in a body that has many promises and vows, deeply ingrained patterns that are alien to the higher soul. Our animalistic identity binds our G-dly soul to the physical environment and to numerous unholy and sometimes repulsive thoughts, words and deeds it continuously pursues. The day-to-day pressures of life knot our hearts in frustration and distress. On Yom Kippur the soul goes free. On Yom Kippur the soul declares, "The vows are nullified." I'm not tied down to or by anything. I am holy, I am G-dly, I am good. The soul comes back home to the deepest part of it self, rediscovering its innocence and innate spiritual splendor. On Kol Nidrei night, and throughout the 24 hours of Yom Kippur, each and every one of us is empowered to go back to that "Tekiah" part in us -- the absolutely free core that makes us human. And as the sky above turns into a blend of pinks and crimson, reflecting the sun's brilliance dipping over the horizon, Yom Kippur is culminated with a "Tekiah Gedolah," an extended Tekiah blast, representing the undiluted cry of an innocent baby. The cry of a soul that is completely pure, a soul that wants nothing more than to connect with G-d, forever. When that Tekiah Gedolah is culminated, we cry out: Leshnah Habbah Beyerushalayim! Next year in Jerusalem. For this Tekiah constitutes a foretaste of the Tekiah Gedolah that will herald the coming of Moshiach and the complete redemption, when the inner sacredness and G-dliness of every Jew and of the entire world will emerge in its full splendor. During the last moments of Yom Kippur each of us is given a taste of the type of person you and I will become when Moshiach arrives speedily in our times. I’m sitting here waiting on pins and needles for my younger son’s teacher assignment and my older son’s middle school schedule to arrive. I never really know if the teachers’ personalities will be a good match for my children’s needs. One thing I do know is how to reduce my children’s anxiety to make the transition as smooth as possible for the new school year. When their anxiety is manageable, their teachers are able to work with them more easily and develop a trusting relationship with them. Here are my seven steps to start the school year on the right foot. We ride our bikes to the school playground as often as possible during the summer. This keeps the school present and alive in my children’s memory, and they will reminisce about people and school events while playing. This morning we watched some teachers come back to school to set up their classrooms, and we peeked in the windows to see what the first grade classrooms look like. My children tend to lose patience on long shopping trips, but they do enjoy selecting a new pair of shoes or one outfit for school. My older son prefers a crisp white shirt with a necktie every day, so we have to talk about the types of clothes that are best for art day and gym day. This summer they each got a new t-shirt with the name of the college that my husband and I attended, and they plan to wear those t-shirts to school with pride. Again, forget the long shopping trip. Pick out a few necessary supplies together, for example, a pencil box and portfolios. The step that makes the school year more real for my children is the act of writing their names on all of their supplies. I also have them color code their supplies according to subject – green for science, purple for music, etc. Every year I contact my older son’s IEP team leader to arrange a visit to school before the first day. This gives my son a chance to practice opening his locker, see his classrooms and say hello to some of his teachers. It is easier for him to adjust to the school environment if he has a chance to visit while it is still relatively quiet and peaceful in the halls. His middle school principal recognizes the fact that all students benefit from this type of visit, so the middle school has a “transition day.” The principal formally welcomes families and encourages everyone to walk through their schedules until they feel comfortable in the building. If your school does not offer a transition day or welcome-back social, work with your parent-teacher organization to start a new tradition. The most important part of the transition visit for my son is to get a photo of him with at least one of his teachers, as well as photos of the classrooms. If I know who his teacher will be in advance, I arrange a school visit on the day after school ends in June so that my son can look at the teacher photo all summer long. His second grade teacher actually e-mailed me photos of her summer vacation so that my son would understand that she is a complete person outside of school. I use the school photos to make a social storyfor him. Hitting the books in September is a big change from our relatively relaxed summer routine. Review old material and practice emerging academic skills so that children and teenagers will understand what will be expected with the new school year. My children don’t sleep late, but they need help staying on schedule as we get ready for school in the morning. Start the morning routine at least one week before school starts so that there are no surprises on the first day of school! Here’s to another year of growing and learning! 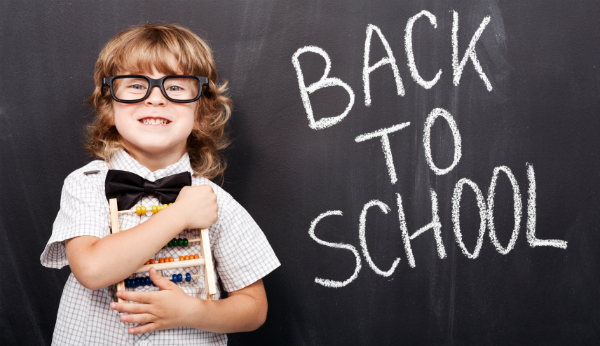 What are you doing to ease the transition back to school? We all know the wrong things to say during a loved one’s meltdown. But what’s the right thing to say or do – or is it better to say and do nothing during a meltdown? Amelia W.: I feel like we’re still trying to figure it out. For the most part he does not want to be touched and will sometimes bury himself under his cushions in the playroom. Tonight however, we played our new game. We go upstairs where we sleep-two queens pushed together on the floor- and throw or push pillows and blankets at each other. I also toss him on the bed and squish him. So essentially we practice heavy work and deep pressure. Natalia E.: Do we know what initiated the tantrum? Where are we? What do we know from experience – or what can we observe going forward- that helps *our* child? 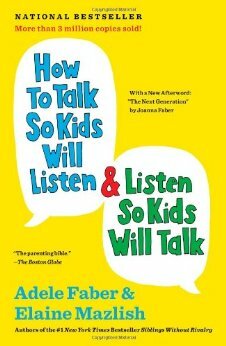 I benefited hugely from reading “How to Talk So Your Kids Will Listen and Listen So Your Kids Will Talk.“ I’m sure nothing works for every child and in every situation, but I had great response when I was able to figure out what had instigated the tantrum and acknowledged it without trying to fix it. “It looks like you’re sad that your brother got on the bus and you have to stay home.” Less talking is more. Let the child correct you if they can/wish, if you get the “reason” wrong. Don’t try to fix anything in the moment. Don’t worry about what people around you think. All easier said than done in the early days. 2 more book suggestions, both by Judith Simon Prager: Owie Cadabra ‘s Verbal First Aid For Kids and Verbal First Aid: Help Your Kids Heal From Fear and Pain – And Come Out Strong. Great scripts for when a person is injured, which can be modified for other situations. You asked about what to say, but I have to mention that what helped us most is homeopathy. Once we found the right one, I could give a dose of remedy and a tantrum would stop instantly. With long-term homeopathic treatment, the meltdowns vanished. Certainly, part of it was growth and maturity, but the effect of the remedy was too prompt and dramatic to discount. Amy S.: Washing hands in warm water or a bath when possible with Pascalite Clay, firm hugs with downward back rubs, singing and rocking while gently running my fingers along his face, jumping, high protein snacks as soon as a small upset occurs and every two hours regularly throughout the day, a cooler room (often heat adds to meltdowns), quiet places (so many times we’ve sat in the car for hours to just calm down), nature walks, looking at relaxing pictures, and harp music. Lynn F.: We can be upset at home and have time to calm down in a separate room or next to me. The hardest part for us is getting so upset that we want to ‘lash out’ at those around us for how we feel. Jacklyn B.: My 2 year old says the same statements over and over. I find holding her close and repeating what she’s saying, letting her know I hear her, really helps her to calm down a bit. There are definitely times when she makes it clear that she does not want to be held or consoled, and I try to stay close by and available for when she is. For me, the hardest part is keeping myself centered and cool when her meltdowns are exceedingly long. Ann Marie D.: I just tell George that I am walking away. If we’re in public, I do the best I can. Vera S.: For my daughter it’s cold water with a straw. It’s like magic! It doesn’t really help with regular ol’ crying, but she can very easily go from crying to hyperventilate-y. A cold drink of water sort of resets her breathing and physically cools down her sweaty self. The straw is just because it’s hard for her not to spill when she’s upset. Maureen L.: For us, there is no one thing that always helps or always works. I listen to my gut in the midst of a meltdown and just try various things. Sometimes going outside in the cold in winter helps (or feeling the cold air from the freezer in summer), sometimes reflecting his feelings helps (“you are really upset because you wanted to put the straw in your cup!”), but sometimes redirecting him away from his feelings helps (“whoa! it rained earlier; there are some big puddles outside waiting for us!”). Sometimes deep pressure helps, but often I can’t get close enough to him to offer that pressure (he’ll fight me off). We try classical music, and if it’s summer, putting him in sand usually helps (sensory input). We’ve tried baths, but he fights us too much. Usually for us, it’s a matter of just waiting for him to calm down a little, offering loving words while he’s going through it, and then when he’s calmed down a bit, we can then offer more help like deep pressure, massages, baths, feeling slime, spinning, swinging, etc., in order to help him calm down fully. What works for your family during a meltdown? Recently, I had the privilege of attending the CEC conference in Grand Rapids. While at the conference, I attended a session entitled, “Sane and Savvy Strategies for the Busy Teacher.” While at this session, I listened to the presenters, Erika Lusky and Julie Rains, share a comprehension game called Enbrighton that they created to help students with special needs better understand what they read and develop higher level thinking when discussing a book. Enbrighten™ is an engaging and thought-provoking comprehension game designed to empower students with the tools necessary to approach and ultimately understand both narrative and informational text. This strategy emboldens students and teachers to establish comprehension as a process of cognition rather than something assessed by an isolated set of comprehension questions. Enbrighten™ also encourages the development of metacognition, critical thinking, listening, and speaking skills within the classroom environment. It is designed to act as a supplement to any curriculum and can be used with any preexisting classroom text. Each student is assigned a strategy job. If playing the game with a large group, students can work in teams. The student who is assigned this role needs to summarize, or recap in 1-2 sentences, what the story is about. The student who is assigned this role needs to refer to the text to pick out 1 or 2 “trick” or “interesting” words, write that word down, and use context clues to come up with a definition. They may then use a dictionary or other resource tool to check their definition. The student who is assigned this role needs to clarify any part of the story that may be confusing. This person should go after the questioner. If another student (or team) poses a question, it is the clarifiers job to answer. This is arguably the most difficult strategy job and should only be assigned to those students who would succeed at this job. Personally, I have yet to introduce this strategy job into my classroom. The student who is assigned this role needs to draw a picture of what is happening in the text. The student who is assigned this role needs to make a prediction, or guess, as to what is going to happen next in the story. The student who is assigned this role needs to pose a question to the other students/groups about the text. They can also ask an open-ended question or write down a question that they were confused on while reading. Text is read aloud, within the small groups, or independently. (You can differentiate depending on skill level of students and level of text.) Students can take notes on what is being read. At an appropriate stopping point, ask the students to each write down one idea from the text based on their strategy. Call on a group, or student, to share their idea. Stress to the students that points are not earned for correct answers but for sharing ideas, getting the discussion started, or explaining your thinking. Students (or groups) can also receive points for expanding on another person’s (groups) idea. The Enbrighten website does provide a rubric for each strategy job that can be purchased. This is beneficial if the game is played in a classroom setting to allow for student progress to be monitored and their work to be evaluated. Remember that old back to school commercial with the mom floating down the aisle of the office supplies store while the holiday classic “It’s the Most Wonderful Time of the Year” played? I never really appreciated that commercial until I became a parent and prepared to send my own child back to school after a long summer break. For some children, heading back to school can bring up feelings of anxiety and uncertainty. Here are a few ways to better prepare your child with Special Needs. During the weeks leading up to the first day, many teachers can be found setting up their classrooms and are often happy to receive visits and even some help from students. Walking around the school, seeing the classroom, where he or she will sit, and getting to know the teacher is a great way to alleviate some anticipatory anxiety. While visiting the school, take photos of your child with the teacher, in the cafeteria, on the playground, etc. Then you can use these photos to create a more relatable social story. “At recess, I will go play on the playground” and include a photo of your child on the actual monkey bars! Most schools post class lists in advance of the beginning of school. Even if it’s just meeting another family at the park for an hour, this is a great way to get acquainted with a new classmate or reacquainted with an old one. Letting your child pick out her school supplies might help her feel proud of her utensils and feel reminded that she’ll have items that are exclusively hers in the classroom. One more expectation to be met! If your child will be spending time in the general education (mainstream) environment, it might be helpful for his typically developing peers to understand a bit about your child. This book can be a very basic introduction to your child. In the book include some things about your child that makes him unique and all the things that make him just like the other kids (i.e favorite food is pizza, loves to swim and play Minecraft, etc). This book will may also be for the parents of your child’s peers to help them explain your child’s differences to their own kids. Transition is hard for our kids. Hopefully these tricks and tips will help you and your child ease right into the beginning of a (hopefully) successful school year! Summer vacation can be trying for parents, especially those with special needs children. Although the break offers great opportunities for fun, relaxation and bonding, there is a lot of time to be filled and even the most prepared parents sometimes run low on ideas. Keep in mind that summer presents a great opportunity for learning and language stimulation. 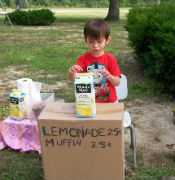 Here are a few language-rich suggestions to make your child’s summer fun and stimulating. Preparedness is essential for a smooth transition to camp. Many children experience difficulties with schedule changes and new transitions. 1. Try to visit the camp and rehearse getting on and off the bus or in and out of your car. 2. Practice the new morning routine at least a couple of days ahead of time. Children with special needs typically have less anxiety and do better with learned routines and consistency. 3. Make a visual schedule to help with the new morning sequence. 4. Use a calendar to help your child prepare and count down to the start of camp. 5. Pair your child with a buddy/friend who is also attending the camp. 6. Read simple books about summer camp and what to expect. 1. Draw a bus and other vehicles. Talk about parts of the bus and the sequence of getting in and out of the bus. 2. Have your child tell you the sequence of getting ready for camp, with and without a visual schedule. 3. Learn the days of the week and names of the month. Practice counting and recognizing numbers. 1. Make or draw a flag with your child and attach it to a ruler of paper towel roll. 2. Have a private parade! March around your house to recorded music or use instruments and make your own. 3. Simon Says as you listen to the music or with the instruments. 4. Play motor imitation games to the music. How many sequences of imitations can he/she/you remember? Take turns being the leader. 1. Growing vocabulary of nouns, actions and concepts ( stripes, cut, drum, shake, march, fast/slow). 2. Building memory for motor sequences and following directions. 3. Expanding sentences, depending on your child’s skill level, from single words or approximations to multi-word grammatically correct sentences. 4. Increasing eye contact or attention to our faces (Simon Says and imitation games – blinking, closing/opening eyes, silly faces, different expressions, pointing to various facial parts). 5. Simple question formulation and advocacy skills (Is it my turn? Can I do it? Help me. Show me). 6. Social skills (turn taking, attention, questions and answers, eye contact, facial expressions). 1. Depending on your child’s skill level, have them pick their own flower or vegetable seeds or help you decide. 2. Read The Carrot Seed by Ruth Krauss before you plant. 3.Discuss gardening tools and planting steps. 4. Have your child tell you each step as they plant. 5. Take turns with each step and have your child direct you. 6. Take pictures of your child at each step for a personalized planting book. Have her dictate the story. 1. Building vocabulary (gardening tools, dig, plant, water, outside/inside, clean/dirty, in/out, sunny). 2. Expanding sentence length, grammatical skills and relaying sequential information. 3. Understanding and responding to higher level questions (Why do we need a shovel? Why does a flower need water? What happens next? What happens if we forget to water the seed?). 4. Responsibility for initiating, following through and completing a project. 1. Discuss what you will need to take to a campout, beach, pool or other location. 2. Fill a bag with appropriate and inappropriate items. Take turns picking out an item and discuss whether it is needed, why or why not. 3. Take turns wearing blindfolds and try to recognize items through touch. Have the one who sees the item describe the item to the blindfolded partner using feature, function, category and location clues. 4. Have your child plan and pack a meal. 1. Expanding vocabulary, expressive language and social skills (naming objects, actions and concepts, describing what is going on, waiting, turn-taking, staying on-task). 3. Problem-solving and predicting (What do we need at night? Why do we need a towel? What happens if it rains? What are you going to do if your hands/feet get dirty?). 4. Increasing initiating, planning and organizing skills. (What should we bring? How do we pack?). The most important things to remember are to be aware of and tailor the activity to your child’s skill and interest levels, demonstrate flexibility with your child’s changing interests, be patient, give your child time to respond, model and prompt and have fun! Enjoy the time you are spending together and have a great summer. Full disclosure: my husband, Rob Jacobs, and daughter, Sophie Rittenberg, have attended the annual Friendship Circle dinner for the past several years. Each time they’ve come home and told me what a wonderful evening I’d missed. The space was “cool,” the food was good, there was time to catch up with friends and of course, that they were there to support a tremendous organization goes without saying. I’d wanted to go but with my teen and in-house babysitter otherwise engaged, I missed out. Initially I hadn’t planned to attend this year but my daughter implored, “Eema, I’m going to be in the video so you have to come see it.” So I did. Now I can honestly say two things: I should have come years before and "Wow!" I’m so impressed by what Friendship Circle accomplishes. I’m kvelling over the many teens that devote themselves to supporting and engaging with this organization. Yes, the event itself is tremendous. The site was hip, the feeling in the room was energetic, the fleishigs were yummy and the schmooze time was fun. Yes, I got to connect with friends and acquaintances who come from across Seattle’s Jewish spectrum and are all gathered together in one place in support of one cause. What I wasn’t really prepared for was that moment when the teen volunteers walked into the room. They kept coming and coming and coming – so many teens walked into the room. So many of our community’s best and brightest hopes for our future smiled as they were welcomed with thunderous applause. They really deserved the ovation. These young volunteers set an example for all to follow. They inherently understand what Hillel meant when he said, “if not now, when?” They’re making a difference right now. Over the past school year, my daughter Sophie has served as a Friends@Home volunteer. I know she’s loved getting to know Sage. I knew she would take her commitment seriously. What I didn’t fully anticipate was seeing how she blossomed and grew from her volunteering experience. Whether it’s seeing the emerging empowerment or maturation or just mentschlikeit, I’ve loved how the Sophie-Sage relationship has developed. I’ve also been pleased to see that Sophie’s involvement with Friendship Circle has spilled over into other areas of her life – her burgeoning patience, her willingness to step up, the pride she expresses in sharing her Jewish identity with a special friend. I realize the annual Friendship Circle dinner may be the only opportunity some have to experience all that this organization does. Until I attended this years’ dinner, I, too, was one of those people. I didn’t fully appreciate the entirety and impact that Friendship Circle has on volunteers, parents – and of course children. Friends@Home, Sunday Circle, Sib Circle, Mom’s Night Out, Teen Scene, holiday programming – the calendar is always full. With all of their activities – crafts to celebrations, music to mitzvot – Friendship Circle is more than just the sum of its parts. While I know it may be a little soon to be thinking about the next Friendship Circle annual dinner on May 25, 2014, it’s already on my calendar. Teen Scene Friendship Circle Expands! This year I had the opportunity to get involved with The Friendship Circle and be a part of a program that is making a difference in the lives of countless people in our Seattle community. As a Repair the World intern at Hillel UW, I worked with Chana and Esther to create a monthly Teen Scene program, bringing together high school and college aged volunteers to plan and run activities with our friends at The Friendship Circle. Each month we would come together at Hillel for an evening of fun games, arts and crafts, and dinner all while building new friendships. Our programs created a more inclusive environment for our friends with special needs and an opportunity for our volunteers to be a part of an experience that made a positive impact on everyone involved. At the conclusion of each program our friends would share their favorite activity of the night and leave the building smiling and looking forward to our next TeenScene. Each Teen Scene served as both a learning experience and an incredible example of the powerful impact we can have on each other through the gift of friendship. Participating in Teen Scene was an enriching experience and a great way to become involved with an incredible community. The work of the Friendship Circle helps our friends with special needs bloom as they enter their teenage years and gain the confidence to develop their talents and skills. Our social activities paired with our enthusiastic volunteers helped to decrease barriers and create a more including environment for fun, learning, and friendship. Together with thoughtfulness and caring, we built friendships and lasting memories for everyone involved. Visual timelines are really important during the holidays, as every day is different. Get a calendar for the holiday and use photographs of who is visiting and where you are going. Try and stick to some kind of routine e.g. visits out are always in the afternoon, or a soft play center is always on the same weekday. We have a leisure time planner for our eldest so that he can do things in one hour rotations, otherwise he would spend all day doing exactly the same thing during the holidays. Eating out on vacations can be quite difficult for us. Instead we have lots of picnics – lovely countryside and weather helps! Picnics are easier to manage and therefore more relaxing. What a vacation should be about. I keep a separate outings bag always packed and ready to go with a change of clothes, pads and wipes etc. I just need to add snacks and that way I’m not flying around at the last minute when going out. Slippery sleeping bags and inflatable mattresses don’t mix for my son who has cerebral palsy. We got a good quality DOUBLE mattress and sewed 12-14 big sturdy eyelets around the edges of a fitted sheet. Then we attached a SINGLE duvet cover onto the top of the sheet, sewing down either side leaving enough room for getting in and out/ comfort. Put duvet in first then fit sheet onto mattress using webbing through the eyelets tied underneath. Works like a dream! To make a change from using the buggy/wheel chair we often take Pete out on a Tricycle. A velcro ball and catch mitt set has been fantastic for my son who is unable to catch a regular ball. Great for fun, cause and effect and coordination. Our family bought Janet a trampoline which has been brilliant for her and has also been great for our other kids and their friends. Without the routine of school, my son acts up, so vacations can be hell. I now prepare a vacation routine for him. Even just a basic structure helps, like: ‘wash, get dressed, breakfast, park or some other activity, lunch, play or video, dinner, bath-time, bed with story or DVD’. Meals times are often a source of friction, so in the summer I put a tent up in the garden and we eat in a tent. For some reason the change of scene distracts from what the food is and it gets eaten and I get to lie down whilst he eats! Every time we go to a new vacation destination my son is adamantly against it. We have to get him excited about a new place. Show him what they have there, why he is going to like it and prepare him for the adventure. We involve him in the research and planning, and most importantly, don’t surprise him. Changing older kids can be challenging when you’re out and about. They are too big for change units & the floors are too dirty to lay them on. I take a plastic tablecloth out to lay on a dirty floor & just wipe clean afterwards – its small & portable. Make it easier to communicate about days out – use a camcorder or camera phone and scrapbook to record special moments that you can look at together at the end of the day. Use a scrapbook to tell other people about favorite days out. If you use visual cues to communicate – have small versions of the pictures laminated and attached to a belt ring so that “toilet” “stop” ” drink ” signs or whatever is most important to the child is readily and quickly available. You can then take them out when shopping etc. It’s a good idea to role play with the person what to do if he/she gets lost, making sure they know where to find and how to present their identification card and what to say. Always have little snacks and toys when you go on an outing. John loves his special Mary Poppins backpack where we keep his favorite things which I use to comfort and calm him if it all becomes too stressful or noisy for him. I put in his Nintendo, a toy, a book, drink, snack/treat and also a walkman so he can listen to a story or music. When we go out to busy places with Lilly she wears a bright colored cap for us so we can quickly see where she is at all times. When travelling in the car attach favorite toys or fidgets to long springy key-rings or ribbons. I clip these onto a loop of elastic around the headrest. This way everything stays within their reach. Through nine states and 25 cities, through blistering heat, torrential downpours and rough roads, come what may, 11 women will pedal 1,500 miles along the east coast for four weeks. Their goal: to raise awareness for special-needs children. The international organization joins young volunteers with special-needs children, teens and young adults. The Miami chapter has been in effect since 2007 and helps more than 200 families in the South Dade area with 14 different after-school and Sunday programs. This is the first time women can take part in the event, which will take them to Friendship Circles along the East Coast with their message. Trips with male riders have spanned the country, from California to New York, in six-week trips during the summers of 2011 and 2012; a third is currently making its way through Phoenix. On Sunday, the women set out pedaling north on U.S. 1 toward Boynton Beach, about a 70-mile trip, for the first leg of their journey that will culminate on July 28 in their final stop in the Upper West Side of Manhattan. For four weeks, they will ride for five to seven hours a day. At night, they will sleep at synagogues, at YMCA’s, at motels. A yellow Penske truck decked out in Friendship Circle stickers carries suitcases, Kosher food and a support staff for the riders. Heading the support staff is Rabbi Zalman Perlman, a veteran of the cross-country trips. Along with friend Shmuel Rothstein, the two conceptualized the first cross-country trek. What started as a joke between them, to bike to Perlman’s home in California, soon became eight months of preparation to make the trip a reality. They wanted to make the trip worthwhile and joined with Friendship Circle to raise awareness for their cause. “We thought we were helping to change other people’s lives, but we were just completely different people at the end of it,” Perlam said. Last October, the women wanted their chance at a life-changing adventure. Chaya Goldberg, from New York City, was the first to sign up. All in all, the riders represent five states — New York, Tennessee, Massachusetts, Illinois and California — and three other countries — Canada, England and Slovakia. The riders flew to Miami on Friday to meet and participate in team-building activities in preparation. Each rider had to raise funds to participate. By Sunday morning, $100,000 had been raised and an additional $50,000 is expected. The coordinator of technology at a Jewish day school, Goldberg said the trip is an extension of what she sees in her daily life when she often sees kids in bullying situations. Goldberg has been training for three months for the 60- to 70-mile days of biking. Although she has traveled up to 100 miles in one day, she has never had to get up day after day to do it again. “I don’t think there’s any way that you can prepare for that,” Goldberg said. Chaya Abenson of Manchester, England, has done everything she can to prepare for the stretch of road ahead, including painting her nails in alternating green and purple, Friendship Circle’s colors, with “B 4 F” drawn in white in the middle three fingers of each hand.